Eurovudas Bordo Log Cabin: The Eurovudas Bordo Log Cabin is a generously proportioned log cabin with a total size of 7m by 6m, and a living area of 36.3m/sq. With 44mm wall logs (constructed with a double interlocking tongue and groove) and double glazing throughout, the cabin offers a quiet sanctuary with great heat retention and plenty of ventilation control. The exterior windows and windowed single door make the interior airy and light, and the cabin is accessed beneath a canopy with 26mm thick terrace boards. The roof is constructed from 19mm thick tongue and groove boards, and shed felt roofing material and bitumen shingles are available as an option to weatherproof the roof. Floor boards are included as standard, and are also 19mm tongue and groove boards. 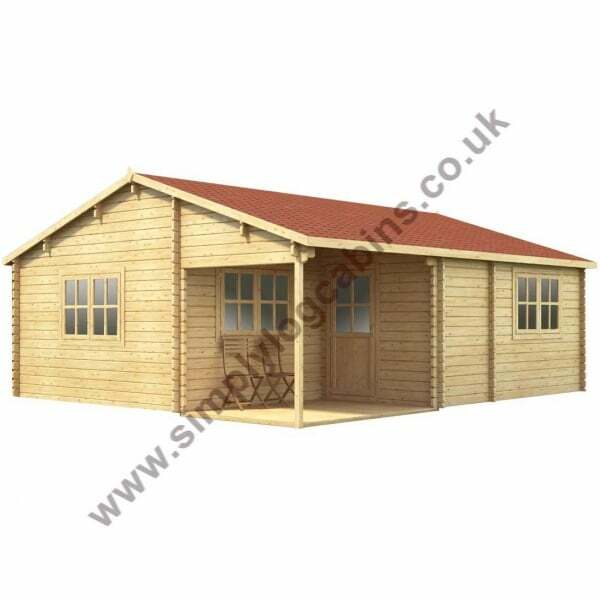 A spacious multi-room cabin, the Bordo is a luxurious log cabin garden building offering lots of functionality and style.